Why do you get condensation between double glazed glass? The double glazed sealed units when manufactured are constructed from two pieces of glass separated from each other around the edge by a (usually silver coloured) spacer bar. This bar should be, but not always filled with a desiccant, tiny silica balls similar to those found in parcels to reduce the moisture levels. In the case of double glazed sealed units, the silica soaks up any residual moisture held in the space within the unit when it is first made. This is an essential part of the unit, as the air inside needs to be dry to give thermal insulation. Around the outside of this metal spacer bar, sealant is pumped to seal the unit and complete the process. After a period of time the seal fails, causing a hairline fracture in the seal, thereby letting air containing moisture in. Various factors can accelerate this breakdown, such as wood frames and putty, poor frame drainage, poor installations not leaving sufficient gap between the glass edge and the frame, use of the wrong type of silicone, locations in extreme sunny positions or where excessive vibrations occur. Once air can get into the unit, the silica originally used becomes fully saturated and condensation starts to form as temperatures rise and fall against the side of the glass. Eventually it will look like the one in the picture permanently. 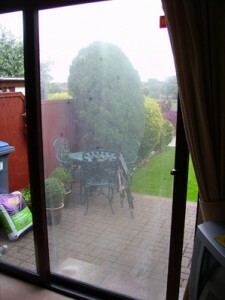 What you can do about misted-up or damaged double glazed sealed units? You can replace the whole window or the simplest & cheapest option is to replace the failed double glazed sealed units with new ones. This almost always means little or no alteration or disruption to the framework (providing the frame is sound) the double glazed glass sealed unit is designed to be removable and replaceable, with no mess and at a fraction of the cost of replacing the whole window. Our team are experienced with all double glazing requirements and can solve all your problems and are only too happy to help. Contact M F Plastics. M F Plastics also install new double glazed Windows, Doors, Conservatories & Fascia-guttering at competitive prices. All new installations come complete with a 10 Year guarantee to give you that extra added piece of mind and once the installation is completed you will receive a Fensa certificate for your new double glazed windows & doors. 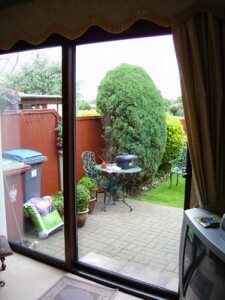 Repairs to Double Glazing, locks & hinges in U-pvc, Aluminium & Wooden frames in Coventry, Leamington Spa, Nuneaton, Rugby & Warwick.